When a Greek sponge diver called Elias Stadiatos discovered the wreck of a cargo ship off the tiny island of Antikythera in 1900, it was the statues lying on the seabed that made the greatest impression on him. He returned to the surface, removed his helmet, and gabbled that he had found a heap of dead, naked women. The ship’s cargo of luxury goods also included jewellery, pottery, fine furniture, wine and bronzes dating back to the first century BC. But the most important finds proved to be a few green, corroded lumps — the last remnants of an elaborate mechanical device. 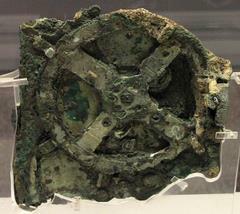 The Antikythera mechanism, as it is now known, was originally housed in a wooden box about the size of a shoebox, with dials on the outside and a complex assembly of bronze gear wheels within. X-ray photographs of the fragments, in which around 30 separate gears can be distinguished, led the late Derek Price, a science historian at Yale University, to conclude that the device was an astronomical computer capable of predicting the positions of the sun and moon in the zodiac on any given date. A new analysis, though, suggests that the device was cleverer than Price thought, and reinforces the evidence for his theory of an ancient Greek tradition of complex mechanical technology.